Thinking about getting a home gym to get into the best shape of your life? We have put together the 5 Best Bowflex Home Gyms to help you make the best choice for you. Bowflex has a full line of all-in-one home gyms that are perfect for toning, conditioning and building strength. Even the most basic machine in the Bowflex line boasts 30 different exercises for your arms, legs, chest and back. This versatility makes them a popular choice for getting an all-over workout for the whole body. Our top tips for choosing the right home gym. Answer the following questions before considering the options. Will you exercise more with a home gym, or a gym membership? Do you have a suitable space in your home or garage? Are you a gym exercise novice, intermediate standard or serious body builder? What is your aim, overall fitness or bodybuilding? Do you want a standard gym or one that can upgrade as you develop? 8 How to Choose from the 5 Best Bowflex Home Gyms. All of the home gyms are based on the company’s patented Power Rod Technology, which many users consider to be superior to using free weights. For one, there’s no risk of joint pain with Bowflex machines. And the Power Rod technology means that you get to take your muscles through a full range of motion, something that’s not possible with stack weights. However, as even the biggest Bowflex fan will tell you, the power rods do take some getting used to. But once you’ve mastered the system of hooking power rods into the cable pulley system, you’ll find that you get a more intense workout. The following is a guide to picking out the 5 best Bowflex home gyms for your specific exercise needs. They are ranked according to manufacturer suggested retail price, which generally corresponds to the number of exercises available on each machine. At the low end, there’s the Bowflex PR1000. At the high end, there’s the Bowflex Revolution. This is the most affordable home gym that Bowflex makes. It also earns rave reviews from both novice and intermediate users. The PR1000 offers 30 total exercises, plus an optional rowing machine rail for getting in some cardio work as well. The machine comes with 210 pounds of resistance. This may not sound like a lot to some gym goers, but as users almost unanimously point out in reviews, it’s more than enough for a rigorous workout for every part of your body. This is a great entry point machine: sturdy, well-made and very versatile for meeting all of your fitness needs. Click here to see our full review of the Bowflex PR1000. 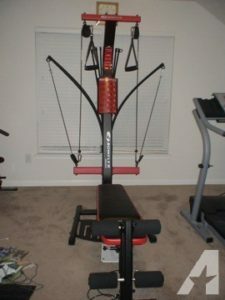 If the Bowflex PR1000 looks right for you, click the link for the latest discount and best price. 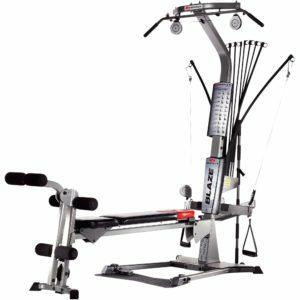 The Bowflex Blaze is a perfect toning and conditioning machine for the intermediate user who is looking for more exercise options than you get with the PR1000. Instead of just 30 exercises, you now have access to 60 exercises. You get a leg extension/leg curl extension and a lower pulley/squat station, which is great for working out your glutes. Like the PR1000, it includes a cardio rowing option. The machine comes with 210 pounds of Power Rod resistance, which can be upgraded to 310 pounds if needed. Click here to see our full review of the Bowflex Blaze. 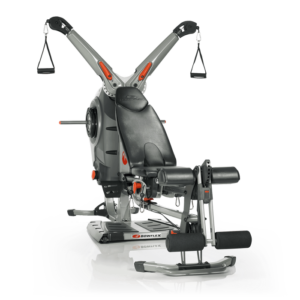 If the Bowflex Blaze looks right for you, click the link for the latest discount and best price. You can think of the PR3000 as an upgrade to the PR1000. 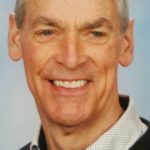 The core user is someone who has already progressed past the basic exercises of the PR1000 and is looking for more of a challenge. Overall, there are more than 50 exercises possible, compared to 30 for the PR1000. While it doesn’t come with a cardio rowing attachment, it does come with plenty of extras. It has a vertical bench press, a lat pull down, ankle cuff grips for working the legs, and upholstered roller cushions for leg extensions. Just like the Blaze, this home gym can be upgraded to 310 pounds of Power Rod resistance. One distinguishing feature is that this machine has a vertical, rather than horizontal, orientation, which makes it easier to store in the home. It wins consistently high user rankings for its ease of use and compact design. 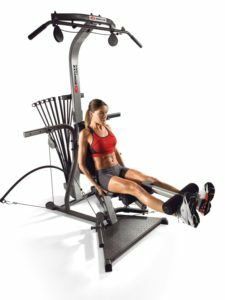 If the Bowflex PR3000 looks right for you, click the link for the latest discount and best price. This is a machine intended for the advanced fitness users looking for an all-over body sculpt and serious strength gains. This is because the Xtreme 2SE comes with 70 different exercises. Unlike other Bowflex machines that can only be upgraded to 310 pounds of resistance, this machine is capable of being upgraded to an incredible 410 pounds of resistance. Bowflex users seem to love it – of all 5 machines, this one consistently picked up the highest reviews on Amazon. One big reason is that many of the exercises on the machine are great for hitting hard-to-reach areas like the back and shoulders, thanks to an angled lat bar. And, like the PR3000, this machine has a vertical platform, making it much more of a compact machine. Click here to see our full review of the Bowflex Xtreme 2SE. 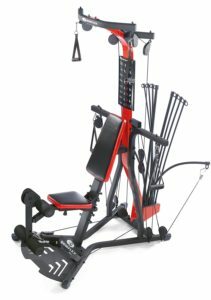 If the Bowflex Xtreme 2SE looks right for you, click the link for the latest discount and best price. The Revolution is the top-of-the-line Bowflex machine, priced at nearly twice its closest competitor. It is fully intended to be your one-stop gym solution and is clearly targeted to very advanced users, including bodybuilders looking to sculpt every muscle on their body. The machine comes with an absolutely incredible 100 different exercises, including a cardio rowing attachment. Users consistently tout the machine’s ability to hit the core and abs, as well as other problem areas of the body. The machine runs off a variant of the Power Rod technology known as Spira Flex. However, despite this machine’s lofty price tag – equivalent to about 2 years of a paid gym membership – it also scores the lowest of all the Bowflex machines on Amazon ratings. In part, this is due to the greater complexity of the machine, which requires more time to build and more time to master. If the Bowflex Revolution looks right for you, click the link for the latest discount and best price. How to Choose from the 5 Best Bowflex Home Gyms. In choosing which Bowflex machine is best for you, the first thing to consider is the number of exercises that are available. Think about the special extras that can help to work specific parts of your body such as the leg extension/leg curl of the Bowflex Blaze or the rowing rail on the PR1000. Ultimately, there’s no “wrong” choice. Each machine is sturdy, built well, and designed to really give your muscles a full workout. You can easily get an all-over workout in just 30-40 minutes per session using any of them. Now is the moment to choose which one of the 5 best Bowflex home gyms best meets your needs and your budget. Scroll back to your favourite and click the link right now to see more reviews and capture the best price with discounts. Happy exercising, and I wish you well in choosing one of the 5 best Bowflex home gyms and achieving your health and fitness goals.